Electrical Vault Maintenance - Vancouver Industrial Electric Ltd. Your electrical system is an integral part of your business operation. We have knowledgeable, skilled and experienced staff with technical resources to ensure you have complete support. Maintenance, electrical testing and its operation are services that help us to determine whether or not the electrical equipment is suitable for safe and continued service. 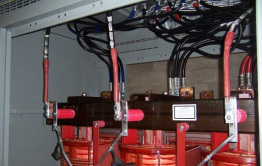 Effective maintenance is critical to the success of any electrical system. We provide professional qualified technical staff to service your equipment and provide thorough test data on equipment and summary reports with recommendations when required.